Chan movies, made by Monogram Pictures, that are included in a new DVD set. SIDNEY TOLER was nobody’s fool. After playing Charlie Chan in 11 films for 20th Century Fox, he learned that the studio was phasing out its B-picture unit and with it the Chan series, so he bought the rights to the character from the widow of Earl Derr Biggers, the novelist who had created Chan. 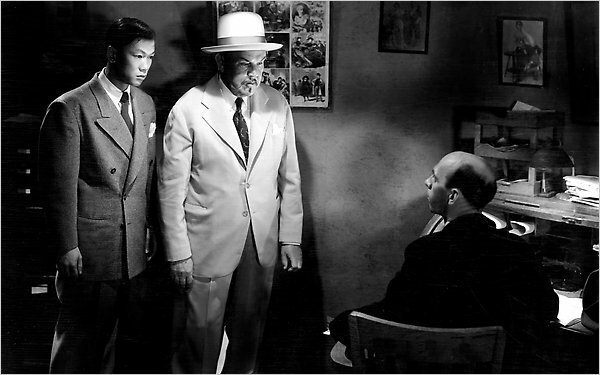 in "Dark Alibi," part of the new "Charlie Chan Collection." Toler offered the character and himself as a package deal to Monogram Pictures, one of the tiny Poverty Row studios that made inexpensive movies for second-rank theaters, and the Chan films went on, although at budgets reduced by two-thirds. Toler made 11 more Chan movies at Monogram, and after he died in 1947, Monogram did six more starring Roland Winters. While the surviving Fox-produced Chans have been restored and issued on DVD, the Monogram ones have been hard to see: MGM issued the first six in 2004, and now four more — three with Toler and one with Winters — have been released in a boxed set from Warner Home Video. Even in the excellent prints provided here, the Monogram films have nothing like the polish of the Fox productions, but they possess their own threadbare charm. Knocked out in a few days, they seem to take place in a cinematic universe quite different from that of the major studios. Most obviously, Monogramland is a lonelier world, with fewer speaking parts in the foreground and little of the background activity that the majors deployed, even in their B productions, to maintain a sense of movement and vitality. And it's a more claustrophobic world: exterior shots are few and far between (usually restricted to lonely stretches of road out in the San Fernando Valley), and the action is usually crowded into a handful of small, recyclable sets. The preferred settings for Monogram movies included cruise ships, boarding houses and nightclubs, closed environments that provided basic dramatic justification for gathering a full cast of characters in one place. 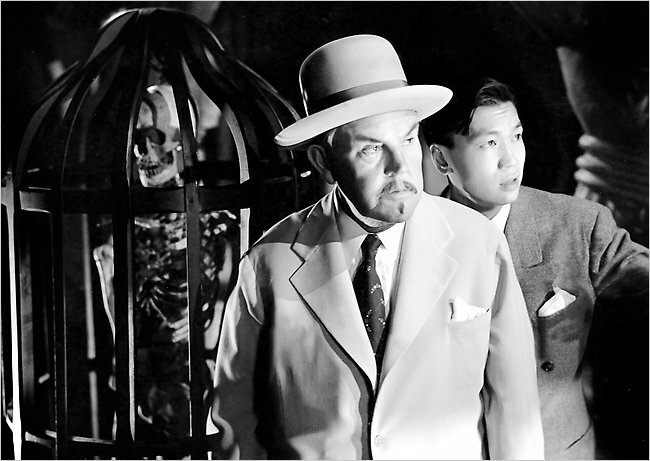 Warner Brothers' "Charlie Chan Collection" offers two boarding houses, one cruise ship and one nightclub (a particularly tacky pseudo-Polynesian variant) among its settings, and the stories they shelter are all essentially the same. There are a number of suspicious people here, one of them is guilty, and Chan will stage a clever trap to force a confession. The challenge for the director is to find some way of varying pace and tone within a ritualized plot structure, a task made more difficult by Toler's uniform line readings and wavering health. For a gifted young filmmaker like Phil Karlson, passing through Monogram on his way to the majors, the Chan films were a chance to experiment. His "Dark Alibi" (1946) opens with a highly stylized sequence of a bank robbery, staged in semidarkness with masked figures moving through a complicated two-level space. The angled compositions and rhythmic editing (at one point a luckless guard is shot down, and the action continues without missing a beat) reflect careful planning and real formal intelligence. Karlson probably spent half of his shooting schedule on that scene; the rest of the picture is fun but perfunctory. For an old hand like William Beaudine, though, "The Chinese Ring" (1947) was just another picture to get through, one of eight he released that year. Beaudine, who began as an assistant to D. W. Griffith at Biograph and directed for the exacting Mary Pickford in the 1920s, had long since abandoned any ambitions to stylishness by the time he arrived at Monogram. Most of his work on this film consists of herding the actors into the frame and getting them to deliver their lines more or less facing the camera. Entropy is a constant threat, as scene after scene winds down into mumbling indifference. The greatest asset of the Monogram Chans is Mantan Moreland, a veteran of the black vaudeville circuit who arrived at the studio in 1939, originally to play sidekick to Monogram's popular teen action star, Frankie Darro. (Moreland and Darro made eight films together, helping to establish a format, the interracial buddy film, which prospers to the present day.) Ostensibly a chauffeur, Moreland's Birmingham Brown character behaves more like a full partner in the Chan family enterprise. Carrying the ball for the immobile Toler, he does much of the work of clue gathering as a sort of sensible older brother to the impulsive youngster played by Victor Sen Yung (identified as Chan's No. 2 Son Jimmy in his first three Monogram appearances, mysteriously renamed Tommy and demoted to No. 3 in the last five). Has any performer ever done more with less than Mantan Moreland? A master of comic timing, he could take the simplest stage direction ("Birmingham looks scared") and build it into a series of double, triple, quadruple takes — reacting to his own reactions. Building on a stereotype, Moreland fully humanizes his characters, and then some. "Dark Alibi" gives him a chance to reprise his vaudeville routine with his old partner, Ben Carter, a surreal duet in which each man anticipates what the other is going to say, answering questions that haven't yet been asked.